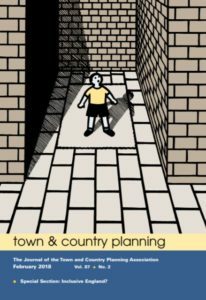 Try to envisage a world without Local Plans, the NPPF, Neighbourhood Planning, Localism and CIL and its clear quite how much planning has changed in the last ten years. And the same is true of communication: not only the means by which we communicate but also the manner in which we communicate. The extent of this change led me to write Public Consultation and Community Involvement in Planning: a twenty-first century guide, which was published by Routledge in July. This article explores some of those changes and provides some practical advice on their implementation. A decade ago, consultation was dominated by the dreaded public meeting. A development team would prepare a masterplan to support a planning application and, bearing down on them from a podium, tell a large group of local residents what was intended – ideally for long enough to minimise comment. But disgruntled locals were invariably present, quick to jump to their feet and oppose the scheme, and rally their neighbours into an angry frenzy. Generally residents would attend only if they objected – what was the point in venturing out to a draughty village hall if you were broadly in support of the proposals? And the local media would attend in anticipation of a dramatic evening, which often resulted in a harmful news story. Not all public meetings took this form of course: many were constructive and they continue today in some circumstances. But generally, development teams now seek more engaging and constructive means of consultation. Participatory planning – also referred to as community planning, community visioning or collaborative planning – is gaining increasing prominence, its engaging approach providing a welcome alternative to the adversarial public meeting. The process of participatory planning varies, but typically it involves pre-engagement research and dialogue; a community planning day in which groups of residents, assisted but not directed by professionals, create visions and solutions which they then feed back to the larger group; development of a masterplan by professionals following local insight; followed by an exhibition at which the masterplan is formally consulted upon. The benefits of this approach are substantial. Early engagement can create a sense of ownership among the community, build trust with the development team and result in positive sentiment towards change. Participatory planning, because of its variety of tactics and emphasis on facilitation, can involve a range of local voices including those who would not choose to comment otherwise. The process frequently accelerates the masterplanning process, partly because it involves not only local residents, but also politicians and planners too. Participatory planning is only effective if a considerable amount of time is invested at an early stage, providing an opportunity for the community to be involved in developing a vision, and it requires considerable faith and an enlightened attitude on the part of the development team. But of those who have taken the plunge, the vast majority would take every opportunity to do so again. In fact that this form of consultation has flourished in every sector, from Neighbourhood Planning to large scale mixed use schemes. As communication has become increasingly strategic, the importance of research in informing the choice of tactics has increased. It is common for a consultation team to compile a consultation strategy internally, using research gathered informally from a variety of sources. However, in line with the increasingly collaborative approach to consultation, local residents are increasingly engaged in dialogue during the very early stages of consultation. Then, as a consultation strategy is developed, the role of research switches to that of stakeholder information and analysis. Researching likely consultees enables the consultation strategy to take into account the appropriate number of residents to be targeted, the diversity within the community and an understanding of where power lies. Without it, a consultation runs the risk of being asymmetrical and failing to reach certain sections of the community, which often includes the ‘silent majority’ as well as the traditionally hard to reach. A recent innovation, stakeholder mapping is proving extremely constructive. It provides the potential to depict a community as an eco-system, assess the power and influence of individuals and gauge their likely reaction to specific issues. It allows the development team to understand an individual’s likely view (be it positive or negative) and can assess the impact of that view on others being consulted. Stakeholder engagement software enables the pin-pointing of individuals geographically and provides data distribution and analysis. This resource is most useful when maintained and continually expanded upon. However it should be used only for the purpose of the consultation and data protection rules adhered to, all the more so with the introduction of new General Data Protection Regulations in May 2018. Monitoring, analysis and evaluation are important elements of strategic consultation. Monitoring occurs throughout; analysis, although it can be on-going, takes place (or is complete) at the end of the process; and this is followed by evaluation. It goes without saying that electronic communication has enabled a more scientific approach to each. I recently ran a consultation in which all data collected, from comments in meetings to online polls, was fed through a consultation website, enabling me to present the client with an up to date consultation report as often as required, at the touch of a button. It is hard imagine that previously the developer would have had little knowledge of resident sentiment until the end of the consultation: today, issues management is a key strategic element of any consultation and we have created the tools to easily identify emerging themes, possible misapprehensions and potential ‘ambassadors’. With the move towards participatory planning, consultation data has moved from being predominately quantitative to predominately qualitative. Qualitative data – observations and comments, usually expressed in words rather than in numbers both provides a context for quantitative data, and enables the consulting body to get to the heart of an issue. And again, recent technological developments have brought about a more effective means of measurement. The increased popularity, power and availability of the internet accounts for much of the change in public consultation over the past two decades. This increased significantly in 2004 when Web 2.0 enabled more effective two-way communication. The rise in individual and community use of the internet, combined with the requirement in 2005 that local authorities and other public bodies ‘e-enable’ all services including planning, public involvement and consultation, means that all development proposals have an online presence – whether intended by the developer or not. Research: The internet is by far the most powerful research resource. A substantial proportion of information that is required in researching stakeholder groups and necessary background information is freely and readily available. Issues management: A constructive consultation is based on the community having access to reliable information, which can be easily sourced online. Monitoring of online consultation provide an immediate and effective means of understanding local sentiment and identifying any misapprehensions. Immediacy: Online consultation has the advantage of being immediate: information can be posted and responded to in minutes. But consultation timelines should not be shortened as a result. On the contrary, immediate communication can only take place if the audience has been targeted and is in receipt of the message. Online communication can potentially spread quickly but only if the message is strong and compelling. Ease of access: Online communication is a medium in which many people choose to communicate and by targeting residents via their preferred means, the likelihood of involvement is increased. Users can take part in an online consultation when and where they want – at home, on the move. Many chose to do so late at night. Because of its increased accessibility, online consultation has the power to reach new audiences – particularly the young and the time-poor. Local authorities welcome developers’ inclination to consult more widely; simultaneously this enables developers to unearth the support of the ‘silent majority’. Dialogue: Online consultation allows for real-time dialogue and an exchange of ideas on a one-to-one, one-to-many and many-to-many basis. Removing hierarchies: Online consultation has no regard for the limiting social stratas that we impose on ourselves. In a busy public meeting, for example, attendees may defer to a dominating character or group leader. Ultimately those members are not adequately represented, despite their presence. Online, and particularly behind the veil of a username, individuals are more likely to voice opinions without fear of repercussions, while personal details remain confidential but are accessible to the local authority as a confidential appendix to the consultation report. Reaching ‘hard to reach’ groups: Many people – particularly commuters, families with young children, the elderly and disabled – are not easily able to attend consultation events. Online consultation provides an alternative, accessible means of engagement. Online consultation can be accessible in both its language and in the varied ways in which information is presented. Promotion: Social media, blogs and the local media online can assist in communicating messages quickly. Moderation: Both websites and social media can be monitored effectively. The way in which a consultation is to be moderated should be determined at the start and ideally communicated via a user guide to ensure consistency. For example, it should be decided in advance whether user generated content is to be vetted before appearing and if so, on what basis comment might be withdrawn. Analysis: Online communication can be very effectively analysed: comprising day-by-day website usage; average session times and bounce rates; analysis of the most popular pages; demographic information in relation to location, gender, age and interest; analysis of how people are reaching the website; results per poll / forum / survey / blog comment; maps to depict the location of respondents. Likewise qualitative analysis which combines a technical and human approach can be more sophisticated than offline analysis. Feedback: A consultation website, email and social media provide ideal means for communicating feedback. Taking this into account, it is not surprising that most consultations are now both online and offline. This is also true of individual tactics: it would be inadvisable to host an offline event such as a public exhibition without announcing it online; likewise, a website or social media campaign would benefit from being promoted both online and offline. But although it does much to benefit consultation, online consultation is not a panacea: this new selection of tactics presents a new set of risks. The fast dissemination of information online, although beneficial in many circumstances, can also be a disadvantage. In cyberspace information can fragment quickly and become used by pressure groups to reinforce their interests and prejudices. Furthermore online consultation, particularly social media, can be seen as superficial and lacking the emotional power and empathy that face-to-face communication can bring. Online profiles can mask identities and if measures are not put in place, it can become impossible to monitor the geographical origin of comments. Standardised response mechanisms give online consultations a bad reputation, and should be avoided in most circumstances. And despite the increase in online communication, a digital divide still exists, particularly affecting BME and older groups. Online consultation is relatively new and a fear of the unknown persists despite many success stories. Common concerns are that the consultation will be hijacked by trolls, that the website will be open to corruption, and that registration will be off-putting. Online, a ‘troll’ is an entity which takes part in discussions purely to disturb other users. Potentially a troll can anger people, disrupt the flow of debate/discussion and use abusive language. Anyone who has run a consultation will know that this behaviour operates both on and offline. Online, there can be effective means of dealing with trolls. It is extremely important to identify this either as anti-social behaviour or merely an impassioned and negative response to the consultation: unpalatable though it may be, the latter should not be dismissed, as everyone is entitled to put forward their views on the subject being discussed. However, activities which are clearly anti-social and thwart the objectives of the consultation should be stopped. Software can be used to identify bad language and ‘spam’ and is advised, in conjunction with monitoring. Where necessary, posts can be removed with immediate effect, IP addresses banned and usernames invalidated. Should a local issue have potential to escalate into a national issue and draw response from across the globe, mechanisms can be implemented to allow only those within a specific postcode area to register to take part in online forums, and the electoral register can be used to check the veracity of identities given. In online consultation, preventative action can be almost too easy: it should only be used when absolutely necessary. With hacking, phishing and spam affecting our daily lives, it is unsurprising that issues of cyber security concern those running consultations. Certainly an unprotected website can leave itself open to abuse and if user details are being collated via an online database the legal and reputational impact can be considerable. However, all websites can benefit from EV (Extended Validation) SSL (Secure Sockets Layer) certificates which ensure that all communications – including user names and passwords – between the browser and the website are encrypted and can only be accessed by the website owner. Registration can be extremely beneficial in restricting consultation responses to a specific locality and understanding more about those taking part. However, those running the consultation should also consider the downsides of registration: potential users may be reluctant to pass on email addresses, passwords and other personal data, and may be put off by the amount of time (perceived or otherwise) that registration demands. Consultation websites should seek to make the process simple and reassuring, explaining the need for registration, referring as appropriate to the security measures in place and making the process as smooth and simple as possible. Typically a consultation website will require a name, postcode, username and password. Any other information, such as a full postal address or demographic data (age, employment or marital status) should be given voluntarily and it is advisable to request this data at a later stage, allowing the user to have built up trust and respect for the consultation and appreciate the benefits in supplying such data. Understandably tactics as new and as powerful as online consultation can raise concerns. But by far the greatest risk in online consultation is not connected to the consultation website itself but the absence of it: failure to provide a platform by which local residents can discuss a proposed development online can result in the developer being unaware of other online discussions, which can then gather momentum and perhaps only come to light when it is too late to address concerns or misapprehensions. With the potential pitfalls effectively addressed, online consultation can lead to more efficient and more effective consultation. This will continue to benefit research and evaluation and will also assist and complement participatory planning. I have no doubt that over the next ten years and beyond, consultation will continue be transformed by technological change. How can be online consultation be made to work effectively? Have a content plan in place – but be flexible. Watch and listen – determine what works best for the particular consultation, when to post and lengths of posts. Google Analytics is a very helpful tool for understanding user patterns. Use stakeholder research and analysis to gain an understanding of the likely take-up. Ensure that a consultation mandate (a statement on behalf of the developer on how the consultation is to be run) is displayed prominently – or that its content is expressed clearly. Put rules for engagement in place via a user guide. Communicate the purpose and process of the consultation. Make the timeline clear and adhere to it where possible; where this is not possible, ensure that the audience is fully informed. Be realistic about how quickly you can respond to questions raised online and communicate your commitment to respond at the start of the consultation. Avoid making the online consultation too complicated: always consider the less digitally aware when drafting web content and functionality. Consider the benefits of making all (or specific) polls and forums available only to local residents by requiring that they register using a postal address. Bear in mind that registration can deter involvement. If using a registration process, ensure that this is quick and simple, and doesn’t demand so much information as to be off-putting. Let people register and get started quickly. Only those with a strong objection to a proposal will persist with an onerous registration process. Use a variety of online tactics, providing the tactics are in line with the consultation objectives and deliver meaningful results. Aim to use a combination of qualitative and quantitative tactics online. Ensure that all tactics, where possible, include an opportunity to respond. Create an enticing home page. Consider the use of video as an icebreaker. Bear mind that people have shorter attention spans online. Write content specifically for the website: do not be tempted to simply install the content of a document or leaflet online. Ensure that text is crisp and clear at all times. Break substantial information into manageable chunks. Ensure that information is presented in a variety of different ways. Provide enough information to enable people to make an informed response. Create content that is suitably compelling for people to engage with and share. Use images, illustrations, maps, videos and slideshows to bring the content to life. Link surveys and forums to background information to ensure that those responding are adequately informed. Provide ample visual material. Mapping can enable residents to zoom in on an areas in detail and add text, video and comment. Consider the use of slider bars. This is a visual and effective means of determining relative levels. It works well in budget setting but could also be an engaging and useful tool for community input in landscape design or other decisions. Post regularly and on behalf of various members of the development team but determine how comment on blogs will be fed into the analysis prior to permitting comment. Consider allowing members of the community, such as representatives of a stakeholder engagement group, to blog. Ensure that those who blog on behalf of the development team understand the key messages and the scope of the consultation. Document libraries can be used to hold complex planning documents such as relevant local planning policies, or at the end of the process, the documents which make up the planning application. Use hyperlinks to enable consultees to access extensive information if they choose to do so (ensuring that the hyperlink opens a new window rather than taking the residents’ attention away from the consultation website). Use online forums to invite comment and discussion on a range of issues. Prior to launching an online consultation, determine to what extent the development team will interact and if so, whether to do so in a corporate character or an individual’s name. If taking part in online forums aim to facilitate, but avoid arguing at all costs. Put in place a mechanism whereby residents can select a preferred option from a list of choices, and second and subsequent lists are selected by routing software in relation to the initial choice. Don’t be tempted to use social media just because it’s there: consider its function and whether it can meet the aims and objectives of your consultation. Facebook, for example, was designed as a means to communicate with friends, share photographs and videos and to arrange social activities. It has the means of addressing some consultation objectives, but due to the inability to gain user data and therefore meaningful analysis, Facebook’s role as a consultation tactic is limited. Likewise, Twitter is a useful means of promoting a consultation but its 140 character limit restricts meaningful dialogue. Bear in mind that many people choose not to use social media, and those that do may not choose to use it to comment on a development proposal. It should not be the sole means of online consultation. If you set up a social media profile, keep it active: nothing communicates a reluctance to communicate more effectively than a dormant Twitter feed or Facebook page with unread Friend requests and posts. Maintaining a social media presence is a time consuming process but can be helped by scheduling posts and setting up automatic monitoring, with results directed to a designated email account. Bear in mind that consultations are never solely online or offline: successful consultations use online to promote offline tactics, and offline to promote online tactics. Use Search Engine Optimisation (SEO) to ensure that the website can be found easily. Consider a range of other tactics such as links on other relevant websites, local press and broadcast media, blogs, social media, links on email sign-offs, signage, posters and newsletters. Provide a means for respondents to contact a person if necessary – ideally both by email and phone. Determine in advance whether you’ll interact on public forums – and if so, ensure that the role is one of facilitation, not refereeing. Ensure that all those posting / responding on behalf of the consultation do so with the same understanding. Keep registered users updated – via email, RSS, SMS or social media. Commit to regular posting. Social media posts can be scheduled via a range of dashboard applications such as TweetDeck and Hootsuite. Keep the website fresh and up to date. Ensure that the online content is in keeping with offline content – this is particularly appropriate if the two parts of the project are being run by different teams. Ensure that messages are consistent throughout the website and the wider consultation. Set up monitoring from Day One. This may be both automatic (for bad language / spam) but should not be exclusively so. If you have to remove a post, let its author know and give them an opportunity to replace it. Avoid vetting comments as this can lead users to question the transparency of the consultation more generally. Provide links to offline consultation, allowing respondents to take part both online and offline. Encourage sharing on social networks to help spread the message. Avoid the temptation to ask open questions the results of which may be difficult to monitor and analyse. Ensure that the consultation website provides a means of quickly extracting information for reporting and evaluation. Penny Norton is the director of PNPR and runs ConsultOnline, on online consultation service. Her book Public Consultation and Community Involvement in Planning: a twenty-first century guide was published by Routledge in July.